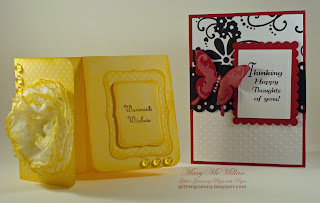 I wanted to post photos of the cards we will be making in the January class. at Paradise Scrapbook Boutique http://paradisescrapbookboutique.typepad.com/ The yellow floral card is my version of a card I saw in a past issue of Card Maker Magazine. I chose yellow for this card. BoBunny's Back to Basic A Gift of Love line, has many beautiful papers, any of which would have made a beautiful card. The gals taking this class will have many choices. They will be able to choose from 3 sentiments, and 5 colors of card stock. They will learn how easy it is to chalk the edges of the tissue paper and for those who don't know how to use the Spellbinder dies... this class will turn them into pros. Several months ago, I saw a card made by Keri Lee Sereika http://cardpositioningsystems.blogspot.com/ I liked the layout and the sentiment she used on this card and I packed it away in my mind for possible later use. I also liked her color choices. I used a border punch, and Spellbinder dies. The Cuttlebug embossing folder will also be something fun for those who have not had the joy of working with them. For those who already are familiar with the dies, it will be fun, because the results are always wonderful. I think this card will be fun for the girls to make and one they will make often. Those who have become familiar with me through my classes, have figured out that I don't want to teach how to make one card. I want people to learn how to use the tools and make many cards. I do hope the girls bring their creations to class. I'd love to see them. Off I go, it's time to think about heading toward the recliner to watch TV. Have a great evening.